Penrith has given a strong indication towards their future halves combination, with young gun Jarome Luai signing a new two-year contract extension. The new deal means the 21-year-old playmaker will remain with Panthers until at least the end of the 2021 season. It is likely that Luai will partner Nathan Cleary in the halves once James Maloney’s time at the club comes to an end. 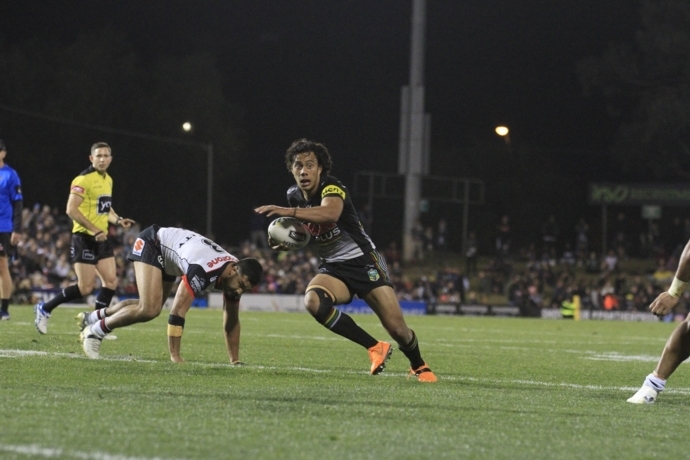 “I feel blessed to re-sign with Panthers because Penrith is my home,” Luai said. A local St Marys junior, Luai progressed through the junior development pathways at Panthers and was a member of the premiership-winning Panthers NYC side in 2015. In 2017 he captained the Junior Kiwis and later made his international debut for Samoa at the Rugby League World Cup. Luai’s NRL debut came against Newcastle in Round 10 last season before he lit up Panthers Stadium with two tries in a man-of-the-match performance against New Zealand Warriors. “Right from the time we first saw Jarome in our junior rep program, we believed he was an NRL player of the future,” Panthers Executive General Manager Phil Gould AM said. “We were thrilled when he got his opportunity to play NRL in 2018 and no one was surprised at the impact he made.